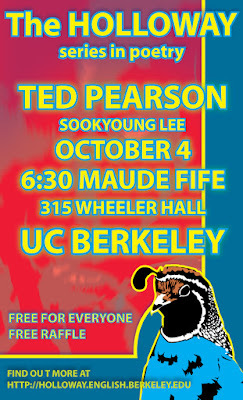 Tomorrow night at 6:30, the third floor of Wheeler Hall (rm 315, the Maude Fife) will be filled with lovers of poetry because poetry is for lovers and because Ted Pearson will be reading there with graduate student, Sookyoung Lee. I like what I've read of Ted Pearson ver,y very much. I am looking forward to this one very, very much. It will be a little while before the next Holloway after this, so you should come to this one if you haven't been this season. I think that October is going to be the best month of 2007 for poetry. I really hope to see you at this reading. Very, very much. Jack Morgan (illustrator) did the poster.